Join us for Easter on Sunday, April 21st from 10am – 2pm! 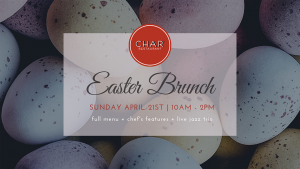 We will be offering our full brunch menu along with special features from the Chef. Pat Coil will be performing with a live jazz trio in the piano bar starting at 11am, providing a lively atmosphere to enjoy music with your mimosas! Reservations are available for parties of four or less here. For larger groups, please call the restaurant directly, at 615.891.7181.